Brinjal (of eggplant or baingan) Kachri is my favorite way to cook eggplant. 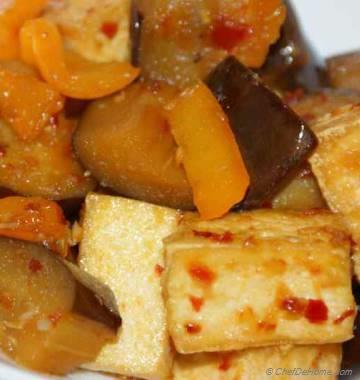 Delicious, quick and prepared in very less oil, this recipe will make your boring eggplant freakily scrumptious. 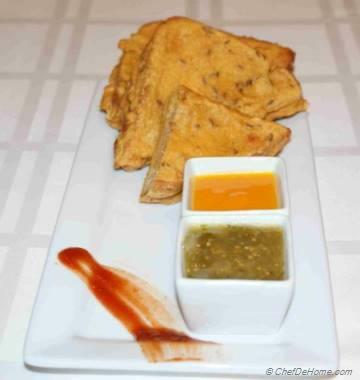 I cook this quick appetizer two ways, one dipped in crispy and gluten free chickpea batter and second spiced with red pepper. You can pair these with few other quick snacks suggestion below and enjoy easy entertaining. 1. In a wide bowl, add 2 cups water. 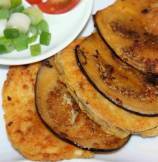 Cut 1/4 inch thick disks of both eggplants (aubergine) and dip slices in water and leave aside. 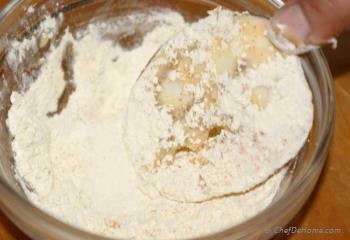 Also combine half of red pepper, salt, turmeric, coriander powder and garlic powder in a bowl and keep aside. 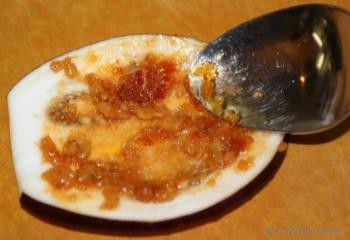 Dipping eggplant in liquid will prevent it from blackening. 2. 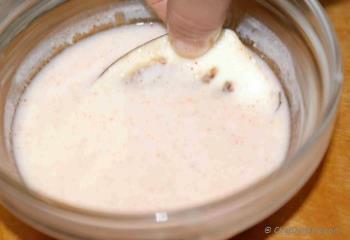 In a wide bowl, pour butter milk and 1/4 tsp salt. 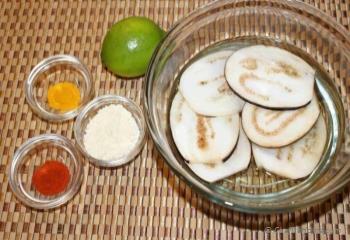 Remove eggplant slices from water and dip all slices in butter milk and leave aside. 3. 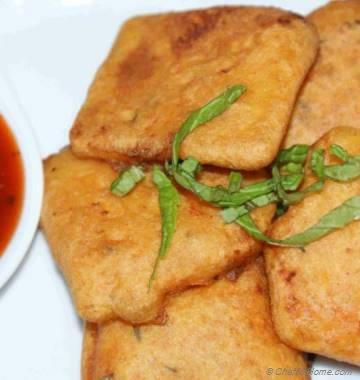 For Chickpea Eggplants: In an another bowl, combine half of the dry spice mixture and chickpea flour, we will double coat half of the eggplant in chickpea flour and spice mixture. Heat oil in pan, take one slice at a time from butter milk, dip disk in chickpea mixture and then repeat dip in butter milk and then again in chickpea mixture. 4. 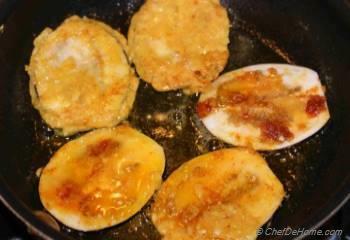 For Chickpea Eggplants - Fry till crisp and golden from both sides. Repeat for half of the eggplant slices. Drain on paper towel. 5. For Spiced Eggplants - Remove remaining eggplant disks from butter milk, gently remove excess butter milk with paper towel. Now sprinkle, 1-2 pinch of spice mixture (we made in step 1) on one side of eggplant and fry with spiced side down. 6. 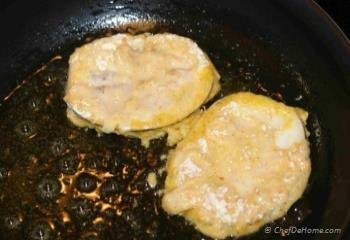 When it is frying, sprinkle the other side with spice mixture too. Now turn side and fry the other side. Fry eggplant till crispy (approx. 3-4 minutes each side). 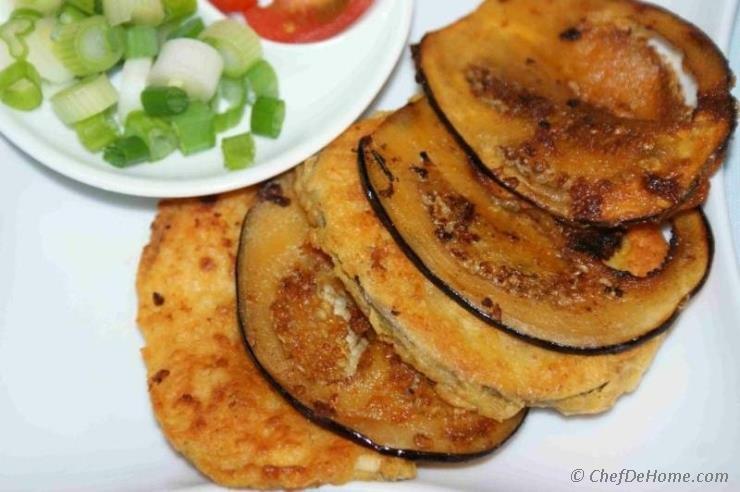 You can fry both chickpea battered and spiced eggplants in one pan at same time also, like I did for this recipe. While making rest, keep'em warm on a sheet lined with rack in oven at 250 F.